The Freedom Skater is easily the craziest idea I’ve ever been pitched. TV and movies tot people with the fortitude and fixation required to follow a single idea over 3000 miles across the U.S. This is Oprah’s domain, right? 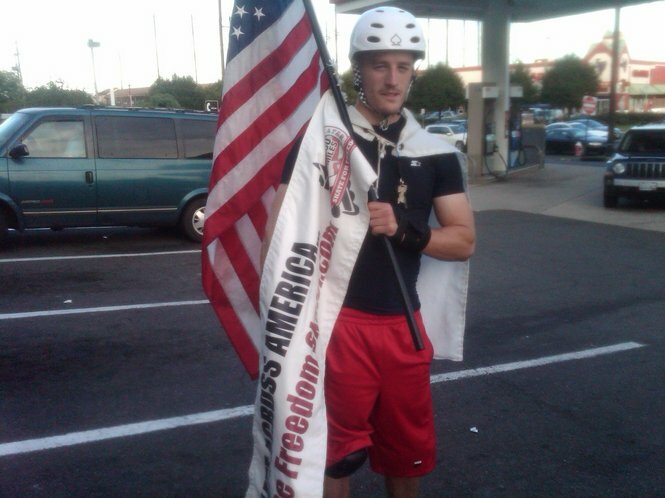 I could only hope because that is the national exposure he deserves, and the publicity I want for Austin Szelkowski, who, crazy as it sounds, skated across the United States, from New York City to Santa Monica California, on roller blades, holding an American flag all for an idea. I am absolutely ecstatic to say that I had a small involvement in getting this off the ground nearly a year ago, in early August of 2010. Working for Dan at American Pioneer Ventures and working on two of my own start-up ventures, both of which are finally growing legs over a year later, I called up a past friend and future business partner, Dillon Norton, to discuss a few joint-projects. Somewhere amid our discussions, Austin’s name came up and this crazy Freedom Skater concept had just taken shape in Austin and Dillon’s minds. I loved the idea but personally didn’t have much faith that backing would be found for it, I’d be doubtful if I was cold-called asking for money to fund that idea. I actually remember when they were scrounging for about 100 bucks from fans, enough funds to buy Austin a pair of roller blades for this journey, I even thought about floating them the money myself, because I believed so strongly in what they were doing. Fortunately I could do one better and knew somebody, Dan Hussain, who shared the passion they did, but also had the means to do something about it. Dan was tossing around ideas for entrepreneurship-based philanthropy at the time as well so I introduced these two parties and being the men of action that they all were, they made quite a trip just to meet. Halfway between them, in Ohio I believe, they met up to do some interviews, discussions, and ultimately make a deal that would send Austin wheeling from coast to coast followed by one of his to campaigners in an RV plastered with Freedom Skater paraphernalia. Normally I would write off such a motivational showpiece; however, I can’t help but support a guy who not only stands, but shouts for everything I believe in. The Freedom Skater represents an ideal that America, in all her pride and glory, sorely lacks right now. Its a go-to, get-done, “take the leap” spirit that defines one person as a leader among thousands of followers and that materializes industry or culture where there was nothing but concept. That spirit fuels entrepreneurship and humanitarianism, makes discoveries, innovates, and brings the world one step closer to the place that you, the doer, want it to be. Who better to guide the world than the driven? Apathy may be the bane of every parent and of every couple choosing a restaurant for dinner, but when it surfaces in life and personal goals, apathy becomes the downfall of our economy, an insurmountable barrier to personal success, and stifling in innumerable ways. Naturally, The Freedom Skater, the man, should be a person of this “go-get ’em” spirit – and he is: Austin started Austin Tells LLC after graduating Kettering University. In fact, all the core personnel on The Freedom Skater Project are entrepreneurs and innovators: campaign manager Dillon Norton, founder of Resistance Marketing, Bob Piesz, also a marketing guru and Founder of Adept Marketing Solutions (launching after the The Freedom Skater tour), my boss and mentor Dan Hussain, the core Freedom Skater investor and founder of American Pioneer Ventures, American Patent Agency, along with numerous other accolades to his name, and of course Austin, the figurehead. Rants and personal pride aside, the reason I made this post is because I want to get the word out about this guy, so go to his Facebook page and click the “Like” button, then cover his wall with your support, and finally, if you’re in town, come to Santa Monica tomorrow, Wednesday June 15, to Ocean Ave. and Santa Monica Blvd. at 12pm to support this guy as he finally walks the sandy beaches on the west coast, completing his tour for personal freedom and a new-agey American Dream.